Phong Nha is my favorite place to visit in Vietnam and if you love the outdoors it will definitely be your number one place to see in Vietnam too! I first heard about Phong Nha when Son Doong’s discovery was announced by National Geographic in 2009 and booked one of the first expeditions into the cave in the summer of 2014. Back then Phong Nha was still a small village, it was mostly undeveloped without too many restaurants and just a handful of places to stay. I visited Phong Nha for the second time in 2017 and its grown tremendously. Tourism in Phong Nha means foreign money was coming in and I’m happy to say that this growth helped the village people live better lives. The new attention from tourism also means that the Vietnamese government has taken a vested interest in Phong Nha. You’ll find new roads with far fewer potholes, consistent electricity that can handle air conditioning, and of course many more jobs for the locals. Even with all this influx, I’m happy to say I did NOT see a lot of extra pollution that seems to be prevalent throughout many other Vietnamese destinations so please clean up after yourself and keep it that way! Traveling in Vietnam comes with its fair share of risks no matter what season you go in. I HIGHLY recommend getting travel insurance before coming to Phong Nha. Thankfully I didn’t need it while I was there but World Nomads gave me peace and mind in case anything did happen. In my two trips to Phong Nha I managed to explore 3 caves, visit the botanic gardens, take a number of scenic drives and eat a whole bunch of delicious food. There is a ton of things for you to do in this jungle village so make sure you add it to your Vietnam Itinerary. If you are planning on going on an overnight expedition into one of the more famous caves you’ll need a larger budget and at least 4 or 5 days here. If you’re on a quick backpacking trip through the country you can still get a great feel for Phong Nha in just a few days. Jump down to the bottom of this post for suggested Phong Nha Itineraries for different length visits. But before you do that check out these great things to do in Phong Nha! Son Doong was the reason I visited Phong Nha the first time and the reason its on the map. Its Phong Nha’s biggest adventure but unfortunately not very easy to visit. The $3,000 price tag keeps most people from even thinking about it and then there’s the application and wait list for this exclusive trip. If you are thinking about going into Son Doong then start saving and message Oxalis ASAP. They are the only tour company that is authorized to bring group tours into Son Doong and they do it with professionalism and of course all the safety gear that you need on this expedition. Inside Son Doong it feels like an alien planet. You’ll go from pitch black caverns to 2 dolines (holes in the cave) with jungles to explore. There are even sections where clouds form and you’ll get rained on inside the cave! If you’re heading to Son Doong get ready for an adventure. You’ll cross rivers and trek through mud in the most epic place I’ve ever seen. Son Doong is one of the best hikes in the world! Phong Nha has 3 public caves that you can visit with day trips that are much more affordable than the overnight trips like Son Doong. You’ll want to set aside a day for each of these wonderful caves but if you’re in a pinch you can visit Phong Nha cave in the morning and Paradise Cave in the afternoon. Dark Cave on the other hand is an experience in of itself so I wouldn’t try to combine it with anything. Phong Nha Cave costs 150,000 VND ($7) to go in and will take about 3-3.5 hours to get to and explore. You have to take a boat there and they run from 7am – 3pm at a cost of 360,000 VND ($16) the cost can be shared if you find a group at the docks or you can hire a private boat. While at Phong Nha cave you have the option to also see Tien Song Cave for 80,000 VND ($4) and will need to pay the boat a little extra to wait. Paradise Cave costs 250,000 VND ($11) but you can easily get to it via motorbike. You’ll want about 2-3 hours to get there, explore the cave and return to Phong Nha and if you go by motorbike I highly recommend taking the loop around the park because the views are stunning! Inside the cave you’ll find large stalagmites, stalactites, reflecting pools and amazing rock features. They light the cave up quite nicely allowing you to take photos even with a smart phone and there’s a set path to follow to keep from destroying too much of the natural ecosystem. Dark Cave costs 450,000 VND ($20) to visit and although it only takes about 2 hours to visit you might want to budget extra time to relax in the nearby springs. 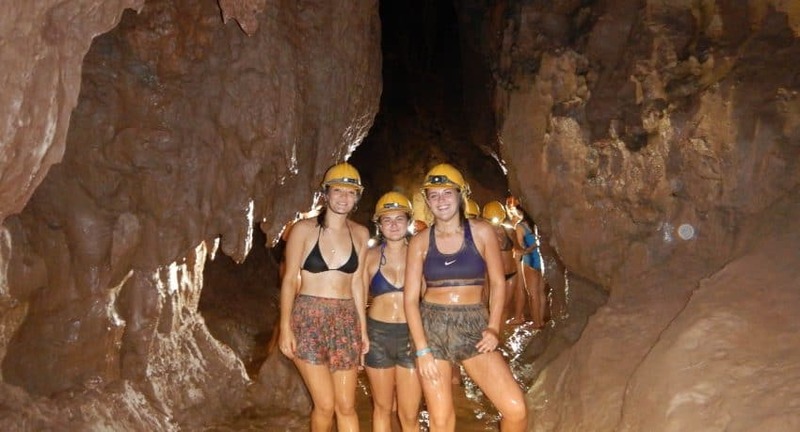 An adventure to Dark Cave will require you to swim, kayak and zip line so it might sound like its expensive but you get a lot out of it compared to Phong Nha and Paradise caves! The best time to visit Phong Nha is during the dry season. It gets hotter but you’ll enjoy blue skies and breezy days to cool you off. Many websites say the best time to come to Phong Nha is from February to August but the rainy season really starts as early as July so I recommend visiting Phong Nha from February to June. That being said both of my trips to Phong Nha were in the middle of the July-August monsoon and I still had a great time! The biggest advice I can give you is do NOT visit from October-December since that is typhoon season. It gets quite dangerous with these hurricane storms coming through and many of the things to do will be closed! The Botanic Gardens might sound like something silly to visit when there are all these amazing landscapes but that’s because “botanic gardens” is a poor name for it. They would be better of calling it a jungle trek with swimming holes and a waterall! The gardens are right near Phong Nha’s park entrance and only cost 40,000VND ($2) so these should be high up on your list of things to do in Phong Nha regardless of your budget. Once you get to the garden you’ll have 3 options for hikes. The shortest heads straight to the waterfall and is just over 1km round trip. The second hike, which we did, is about 2.5 km long and takes you to the swimming hole, peacock enclosure (which made me sad because its so small and is just 1 male and 1 female) and to the waterfall at the end. The trail is well laid out with stepping stones but you’ll be walking through the jungle. We spotted a flock of strange, big beaked birds and some odd squirrel like creature while another hiker we saw encountered a huge family of monkeys! The 3rd hike in Phong Nha’s Botanic Gardens takes you on a long loop to see everything from the 2nd hike but you also stop at some ancient trees and are more likely to see wildlife here. Less travelers pick this hike meaning its a great chance for you to be one with nature. Hang En and Tu Lan caves are Son Doong’s “affordable” younger siblings. They are still huge and magnificent caves but you can get to them with cheaper 1, 2 or 3 day treks. With prices ranging from $80-$330 they are a bit more exclusive than the public caves but perfect for an adventure travel junkie like me! I was fortunate enough to camp in Hang En on the way to Son Doong and when we came back out too. You have one of the most magnificent camp sites in the world sitting in Hang En’s main chamber where you can watch flying foxes head in and out of the hole above. Wake up early and you’ll be able to take a dip in the blue pools while you float watching the sun’s rays reach the last bits of jungle. Tu Lan Cave become more famous in 2017 with the release of Kong: Skull Island. The movie was filmed all over Vietnam and the caves you see in the movie are part of the Tu Lan system. You can join anything from a 1 day trip to a 4 day, 3 night expedition (that big one will run you $660 so better plan ahead). I haven’t personally visited the Tu Lan system but its high up on my to do list for a 3rd trip to Vietnam and Phong Nha. There is plenty to see and do in Phong Nha outside of the national park. I wouldn’t make a trip to the village without visiting the park but since you are going to be there anyway you might as well look into these fun things to do. Phong Nha is a small town with a cute local market. You can easily walk, ride a bike or drive a scooter through the town but when you do be sure to stop in the local market! You’ll find everything from fresh produce to clothes and the occasional souvenir here. Its predominantly for locals to do their shopping but as tourism grows in Phong Nha they are starting to sell other wares that foreigners want. Bong Lai Valley is a few kilometers outside of Phong Nha and full of beautiful farms. The ride there is quite scenic and worth a trip even if you don’t take a bike. We drove it on our motorbikes to save time but you can also stay in one of the many nearby farmstays! When you go don’t forget to check out #7 and try some local chicken and peanut sauce! Pub With Cold Beer started a few years ago and was once the only place in town to get a cold beer. The owners bought up local chickens and make the best darn peanut sauce I’ve ever had from fresh peanuts and still have plenty of cold beer. In recent years they built a small climbing wall, installed hammocks and have expanded considerably. They told me they are even planning to build dorms for people to spend the night in! The Pub with Cold Beer is famous for allowing visitors to pick out their own chicken, as in choosing a live chicken that they want for dinner! On my first visit back in 2014 they brought me a live chicken and I shockingly said “yeah that looks like a good size” but really had no idea how to gauge how much meat it was. When I came back this time they didn’t even ask we just said 1 kg but it was so good that we went back a 3rd time and that’s where the real magic happened. I walked into the chicken coop only to have the door closed behind me. So there I was with about a dozen chickens and I had to pick out my dinner! I finally grabbed one and squeezed back through the door to proudly display it. We named it Dinner but then the little 11 year old girl who was helping us asked “do you want to chop it?” Wait what? Did she just ask me if I want to KILL Dinner? “No way!” I said at first. But then I thought about it and realized, if I’m going to eat it I should be able to kill it. So I grabbed the cleaver and helped turn Dinner into dinner. Disclaimer – I killed Dinner in the most humane way that I could. It would have met the same end if the 11 year old girl chopped its head off instead of me. Bun Cha from D-Arts Zone was my second favorite meal in Phong Nha. If you’re heading north on your trip through Vietnam then this might be your first “northern” bun cha so you should definitely get a taste for this dish. If you’re heading south than it might be your last chance to eat some really good, traditional bun cha! They also offer a “big plate” and you can pay a few extra VND to get a sausage and spring roll with it. 9. Enjoy a boat ride down the river! The Son River is beautiful in any season but especially before the monsoon rains muddy it up. You can enjoy a private boat ride for under $20 and take it all the way to Phong Nha Cave (#2) or just tell the driver you want to enjoy the scenery. Bring a book or a camera and have fun on your boat! Renting a motorbike SHOULD be a top thing to do in Phong Nha on this list but not everyone likes to drive them so I put it down here under more things to do in Phong Nha. You can find a daily rental for as low as 100,000 VND ($4.40) but might want to spend a bit more like 200,000 VND ($8.80) to make sure it doesn’t break down on you. Take your bike into the national park, stop by the Botanic Gardens (#3) or simply drive through the valley created by these beautiful karst mountains! If you’re up for a more rugged road then take the drive all the way to Bong Lai Valley (#6) and eat at Pub with Cold Beer (#7!) Wait, did I just plan your whole day in Phong Nha? The cool breeze, soothing river and nature sounds are the perfect companion for that travel book you’ve been reading. If you’re staying at Ho Khanh’s then there is a wonderful patio by the river. Most hostels and hotels in the area have a nice rooftop or sitting area that you can hang out in or take a short walk to sit by the river. There are a few good spots just outside of Phong Nha town as you head towards the Phong Nha National Park entrance. You’ll even find some locals touting drinks and snacks in case you get hungry. Bonus #12 – Tubing, sunset and beer in a Bomb Crater! One of Phong Nha’s newest bars is the Bomb Crater Bar! It’s a quirky stop between the main Phong Nha town and the farmland near Khuong Ha Village. Why not drink a beer on the river at the Bomb Crater Bar or float in a tube on the river for an awesome sunset! Wild Boar Eco Lodge – $5 per person– The Wild Boar Eco Farm is the highest rated budget accommodation in Phong Nha. It’s outside of the main Phong Nha Town making it nice and quiet with beautiful mountain views. In addition to being the highest rated they are also the cheapest place you can stay! Easy Tiger Hostel – $8 (180,000vnd) dorms – Easy Tiger Hostel is the original hostel in Phong Nha. They have been there from the beginning and know exactly what backpackers want when coming to Phong Nha. You can ONLY book them by emailing easytigerphongnha@gmail.com and can find out more information on the Easy Tiger Website. During the off season they offer 3 nights for the price of 2! Ho Khahn’s Homestay – $40 private rooms – Ho Khanh’s homestay is the best riverside hotel near Phong Nha National Park. They are just outside the main town but have FREE bicycles and FREE breakfast. Their rooms are modern and have super comfy beds. We stayed here for 4 nights and positively loved it! Plus, Ho Khanh discovered Son Doong, the world’s largest cave, so you’ll have a chance to meet the man himself! Son Tinh Hotel– Private rooms for $18 – The Son Tinh Hotel is a budget friendly midrange place to stay in Phong Nha. They have aircon and are in the center of town making it easy to get to all the things you want to do in Phong Nha. Phong Nha Farmstay – Rooms from $40 and up – The Phong Nha Farmstay is the best place to stay in Bong Lai Valley. It’s not as close to the national park but gives you a beautiful farm landscape and has lots of modern amenities. They were the original accommodation for tourists in the area before Phong Nha became popular and they have grown into the best farmstay I’ve ever seen! Victory Road Villas – Rooms from $100 and up – The Victory Road Villas is in the heart of Phong Nha town and one of the only luxury places to stay in Phong Nha. This tiny little village doesn’t have any 5 star hotels, and frankly I hope that there aren’t too many luxury hotels being built so that it stays a quiet village. But lucky for you luxury travelers the Victory Road Villas have a private pool and comfortable rooms. You get a great mountain view from many rooms and the terrace where you can enjoy some tea and a good read! If you couldn’t tell from the article I’ll just have to say it again. Phong Nha is my favorite place in Vietnam! The caves here are stunning and the landscapes will take your breath away time and time again. If you haven’t already added Phong Nha to your Vietnamese itinerary than what are you waiting for? Once it’s on your list check out some of these suggested itineraries for things to do in Phong Nha. None of these itineraries include overnights into the caves since those packages already have itineraries and are a bit pricey but well worth it. If you’re doing an overnight use these to help you plan the rest of your time in Phong Nha. If you only have 1 day in Phong Nha then change your schedule and add another day! But if for some reason you can’t squeeze another day here then here is how you should spend that day. Get up early and rent a motorbike. Drive to Botanic Gardens in the morning and take the 2.5 km hike to the watering hole and waterfall. Head to Paradise Cave and eat a quick lunch out front of the cave. After walking through the cave take the long loop back to squeeze in Dark Cave or Phong Nha cave before heading to Bong Lai Valley for a sunset dinner at the Farmstay. Get started with a 9am info session at Easy Tiger Hostel and then either follow the 1 Day itinerary above or join a group of backpackers to share a boat to Phong Nha Cave and whatever else sounds good from the Easy Tiger talk. Its time for another cave! Take your pick or squeeze both Dark Cave and Paradise Cave in with a motorbike ride! When you get back to town head over to D-Arts Zone for some delicious bun cha! You’re leaving Phong Nha today 🙁 But if you managed to book a late bus or are on a motorbike then you can still squeeze in some tubing and a beer at the Bomb Crater Bar to take a bike ride around town to visit the local market and read by the river!